Guests of Zoëtry Agua Punta Cana get an intimate glimpse of life in the Dominican Republic by taking part in an all-day excursion called The Chocolate Route. 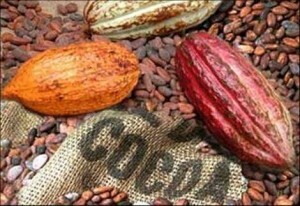 The tour guides you through nearby organic cocoa plantations in the province of El Seibo. A knowledgeable guide discusses the fascinating process of growing cocoa at the plantations from planting to harvest and beyond. When guests finish exploring the plantations, lunch is served! Guests can enjoy a delicious lunch of Dominican favorites at a local restaurant. The Chocolate Route is just one of many excursions you can participate in at Zoëtry Agua, so don’t forget to plan with our concierge in advance! Scuba diving, helicopter rides and zip-lining are just a few fun activities that guests enjoy while staying in Punta Cana. The Chocolate Route tour begins at 9 a.m. and drops guests back at Zoëtry Aqua by approximately 5 p.m. Prices begin at $70 per person. This entry was posted in Zoëtry Agua Punta Cana and tagged coca plantations, Dominican Republic, El Seibo, Punta Cana, resort excursions, The Chocolate Route. Bookmark the permalink.